This cool looking industrial water pipe design, adds an vintage style and more vertical storage to your living room, bedroom, or office space. 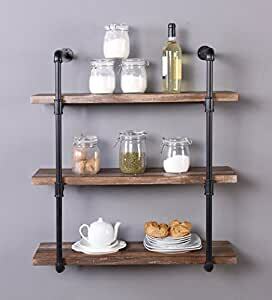 Perfect for Storing decorations or pantry items to organize any room in tidy condition. Enhance storage and display space in any home. Pipe shelf overall dimensions: 35âH x 31.5âW x 12âD. Board size: 1.2âH x 31.5âW x 12âD. Height between shelves: 11.5-inch. Constructed with durable MDF and sturdy iron pipe that bears high weight capacity. Each shelf could hold 40 lbs. Easy assembly required, all hardware and instruction are included. an ample 11.5-inch space between shelves, it is an Versatile organization for all of your storage and display needs. strong bearing load accommodate larger books or pantry items under Sturdy construction and Practical organized function. all your storage needs and will complement any area in the home. Enhances storage and display space in any room, in any home. Height between shelvesï¼11.5-inch without adjustable. Weight capacity: Â Each shelve can hold 40 lbs.